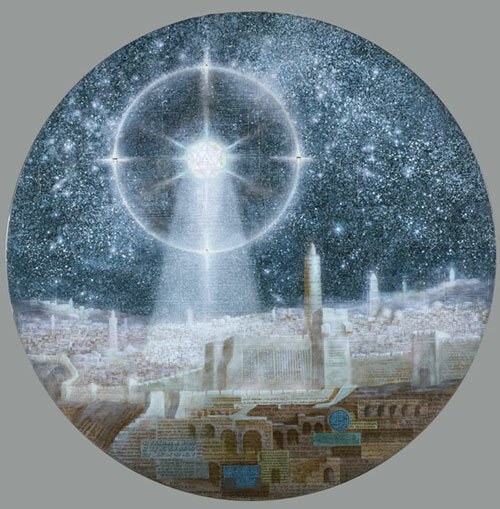 “We were in Jerusalem and one night we saw an unusual phenomenon in the sky, which only happens once in a hundred or so years – there was an enormous moon in a luminous halo, which, it seemed, enveloped the entire sky. That is how the idea for my painting, “Heavenly Occurrence Over Jerusalem,” was born. I love archeology, history, and this city is the crossroads of various religious denominations and cultures, and it is tied to many legends and biblical histories, which have accumulated and create a feeling of duality. If you look at the painting attentively, then you notice that it is entirely filled with words and letters in different languages. The entire sky, for instance, is filled with Arabic characters, excerpts from the Koran, and the city is divided into quarters – there is a Jewish and Armenian quarter, and there is a quarter where the crusaders lived. The houses in each of the quarters are decorated with scripts from the corresponding alphabets – letters in Hebrew, Latin, there are specks of Old Church Slavonic and Armenian. These elements make up the city, civilization. When I made this painting, I was fascinated with Kabbalah. If we look at the painting again, then we can read one of the names of God – each of the four letters of his name are placed sequentially across from the watch hands in the halo around the moon. The form of this work is also unusual. This is also linked to a story. Once I was sitting on a round chair and it broke. I had made “Bach’s Fugue” on that chair, along with two paintings. I really liked to paint on a circular canvas, because linear perspective doesn’t work. It’s an extremely tricky form. When we lived in New York, I was able to order a round canvas of any size, and when I thought up “Heavenly Occurrence Over Jerusalem,” I saw it as a round painting, just like that bewitching moon,” – Dmitry Plavinsky.